For some reason, beef and Baby Lady don’t get along very well. As such, and because I will eat darn near anything, we don’t eat a lot of beef. 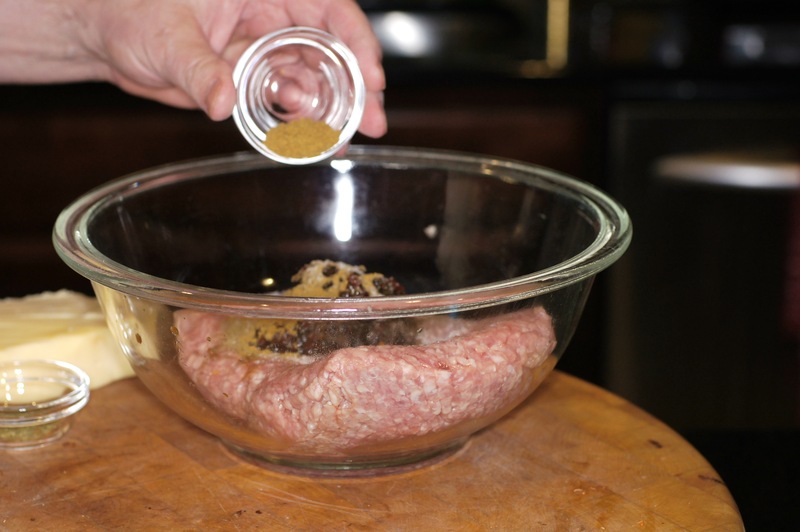 Its why you don’t see many beef recipes on the blog. So, when we want burgers, if it’s just the two of us, we have mushroom, poultry (chicken or turkey) or pork burgers. We actually like pork burgers but if I really want a true beef hamburger, there are numerous hamburger joints in the area. We even have an In and Out near the house that I have yet to try. If it’s more than Baby Lady & me, well that’s another story, Smoked Fourth of July Bacon Wrapped Stuffed Sirloin Burgers. Today, it was simply Baby Lady and me accompanied by beautiful, grilling weather. So, porcine burgers it was. 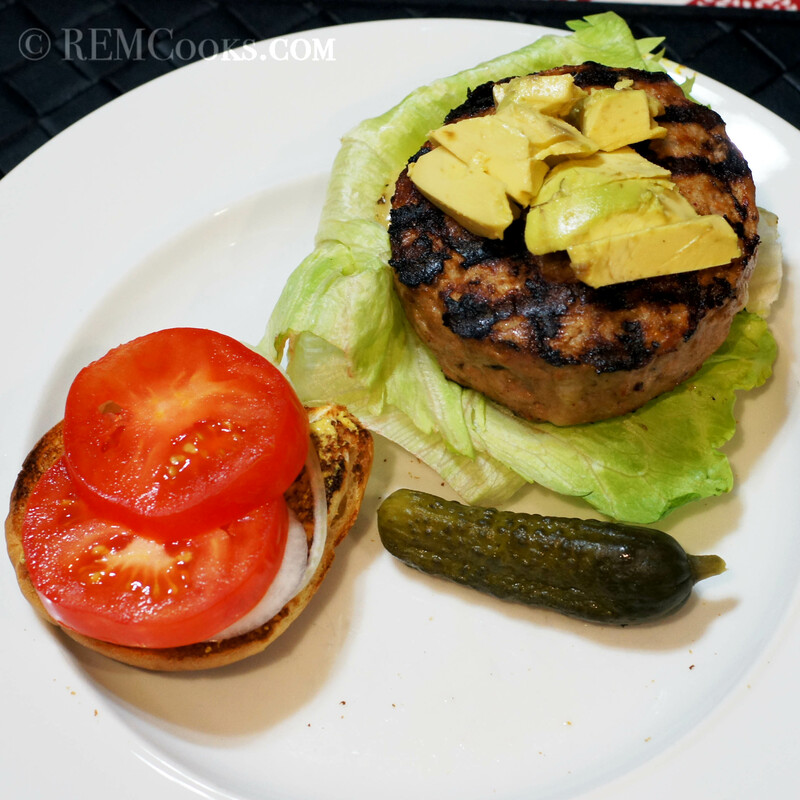 The next twist to these burgers is they are seasoned with pickled chipotle chiles. These chiles have a considerable amount of heat but are packed with unbelievable flavor. Used sparingly, they provide just a touch of heat with a flavor you will find nowhere else. 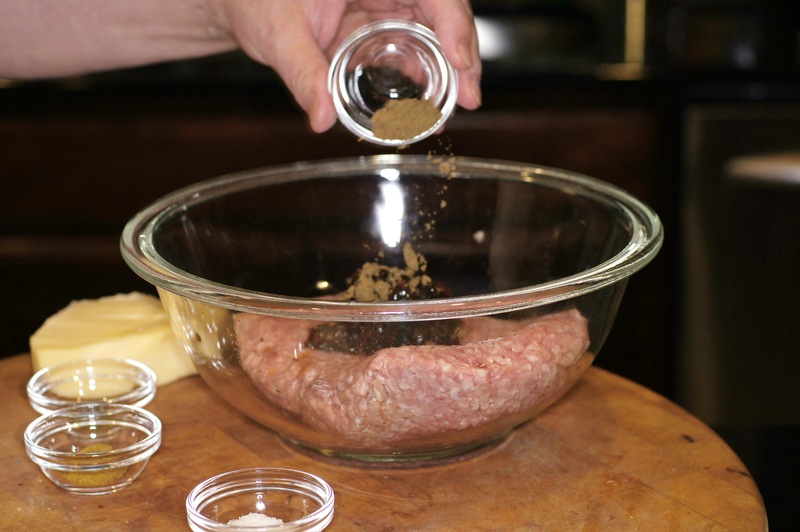 They go exceptionally well with pork are perfect for mixing with ground pork for burgers. You really need to make a batch of these pickled chipotle chiles and keep them on hand. You will be surprised at the uses you will find for them and they keep for about 1 year in the refrigerator. 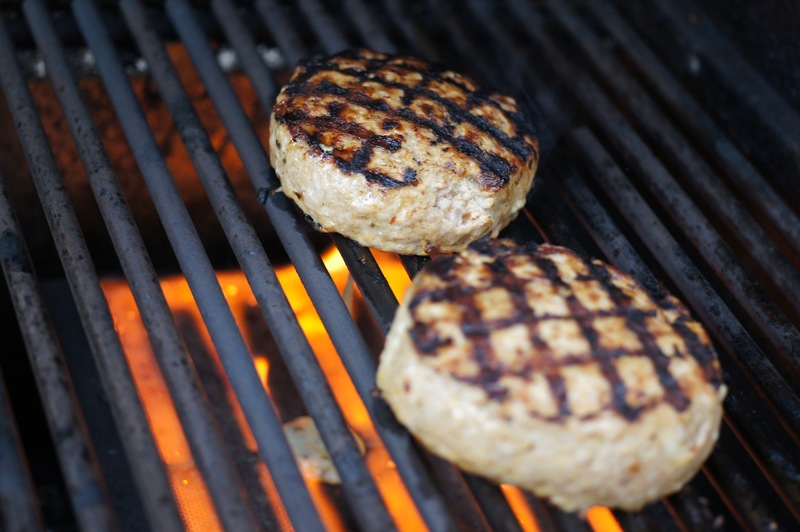 With all of the twists and turns, these burgers came out perfect on a perfect night for grilling! We had a delightful meal and this is what we did. 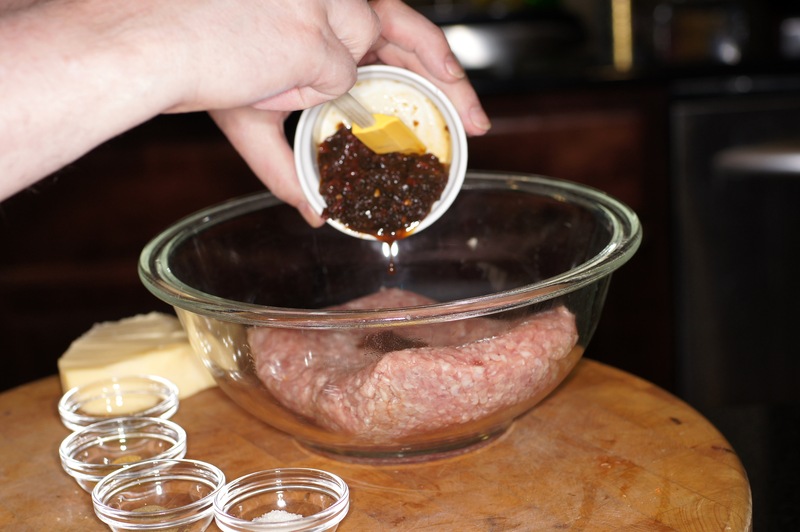 Add minced pickled chipotle chiles to the ground pork. Now, I have personally found that when working with chiles, especially hot chiles, wear some type of plastic glove. Otherwise you get the oils from the chiles all over your hands which inevitably finds its way into your eyes and other places causing you extreme discomfort. 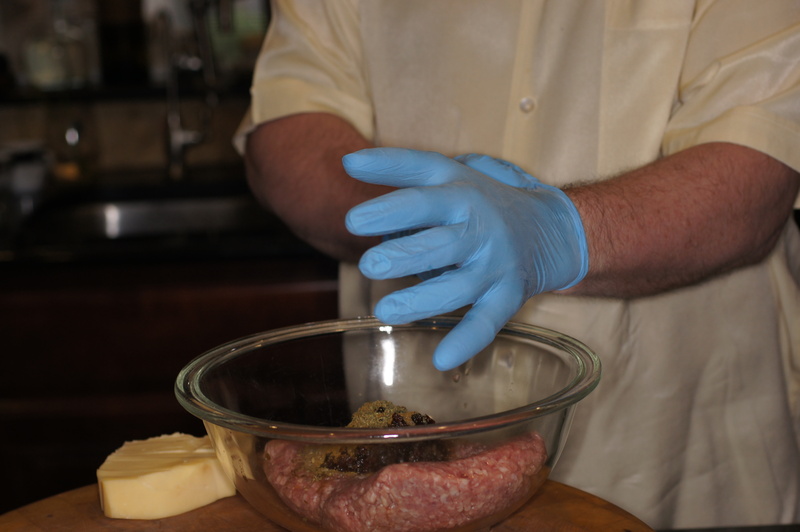 So before mixing all of these ingredients together and making the burgers, put on some rubber gloves. As an alternative, you can place all of the ingredients into a food processor and process but I like the little pieces of chipotle and the food processor will over process the chiles. 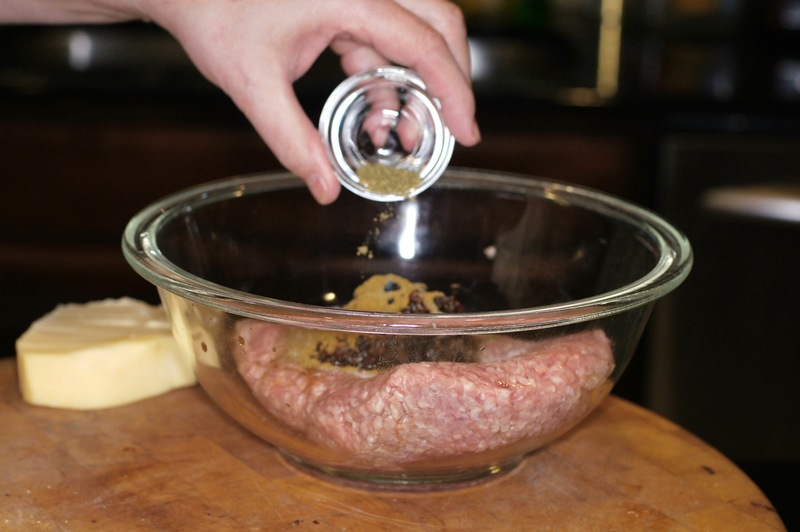 Now mix all of the ingredients together well. 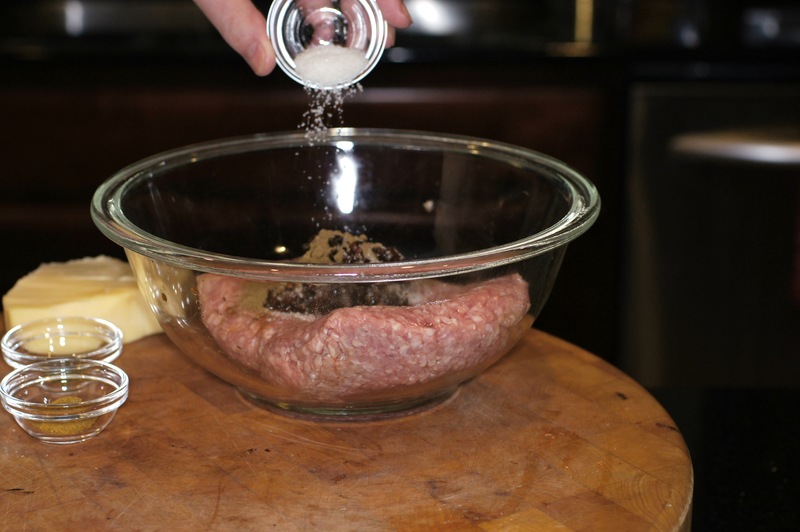 Weigh out 3 oz of meat and roll into a ball. 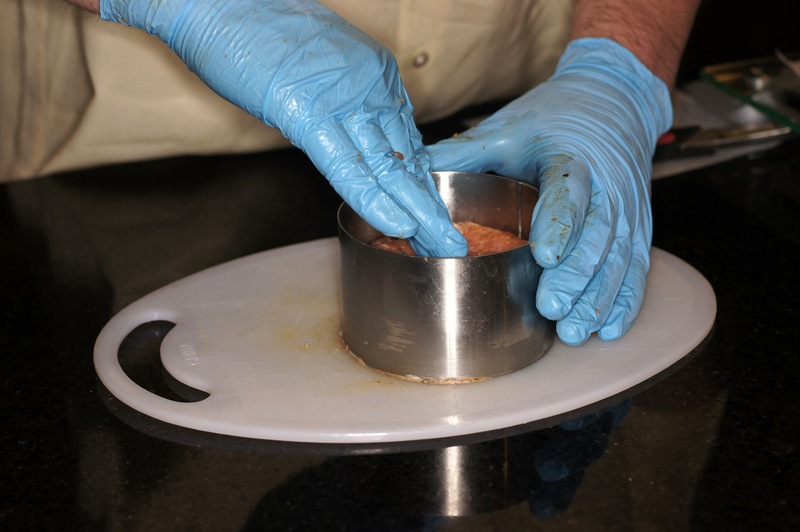 Place the ball into a 3 inch ring mold and flatten out evenly. This forms the bottom of your burger patty. Now add 1.5 oz of chihuahua cheese. 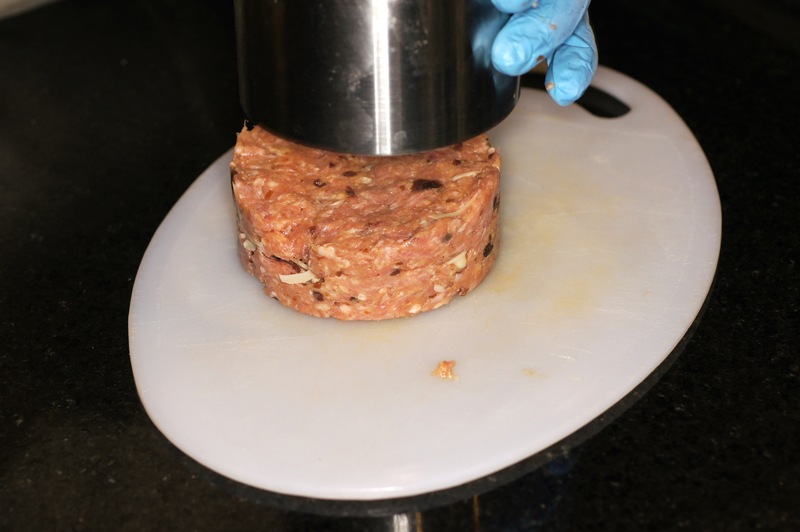 Roll another 3 oz ball of meat and place into ring mold. Flatten it out as evenly as possible and gently remove from ring mold. This forms the top of your burger patty. Now, if you look at the photo carefully, you will see the seam between the bottom and top layers of meat. 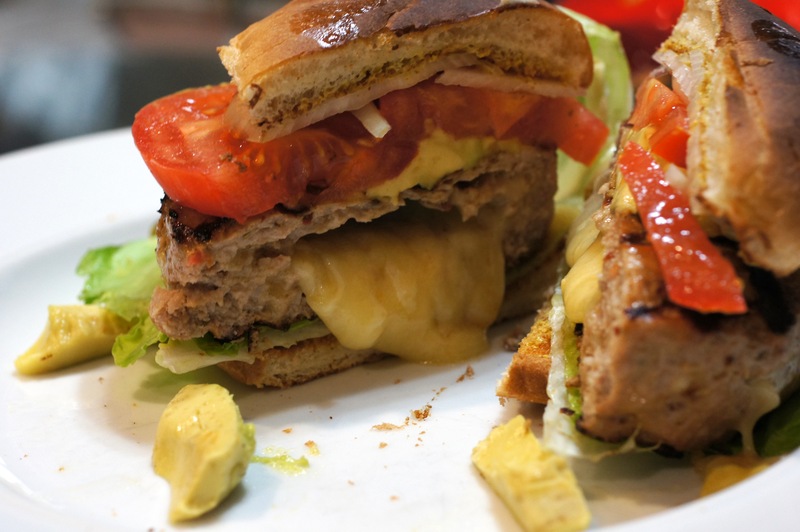 If you were to cook the patty without anything more, it would fall apart and the cheese would all ooze out of the middle leaving you a gloppy mess. So, you need to seal the patty. 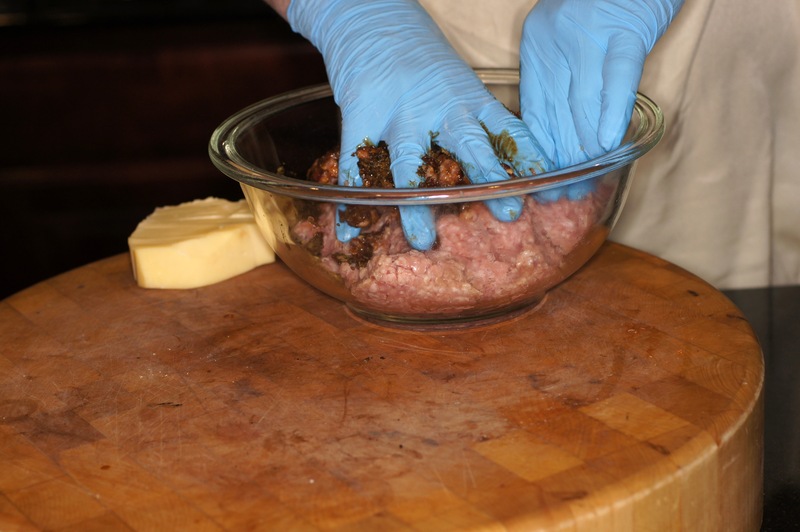 To do so, using the side of your finger, gently pull some of the meat from the top layer down to the bottom layer. Do this all the way around the patty. 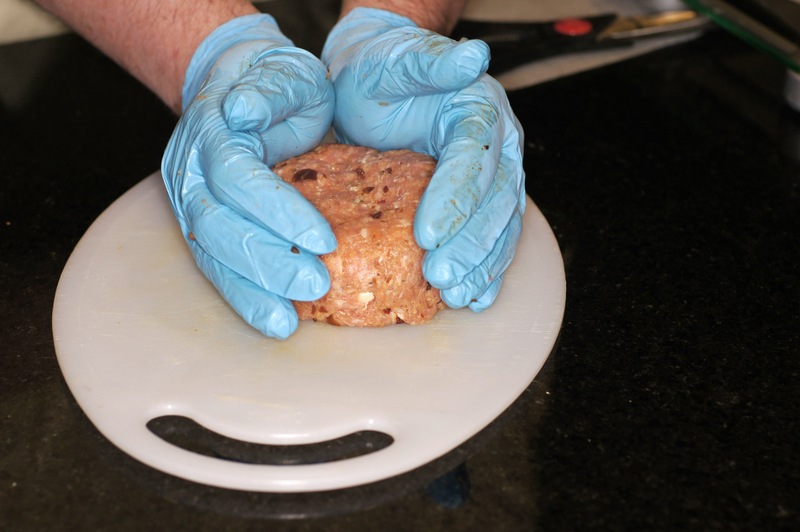 When completed, reshape the patty so that it will fit back into the ring mold. 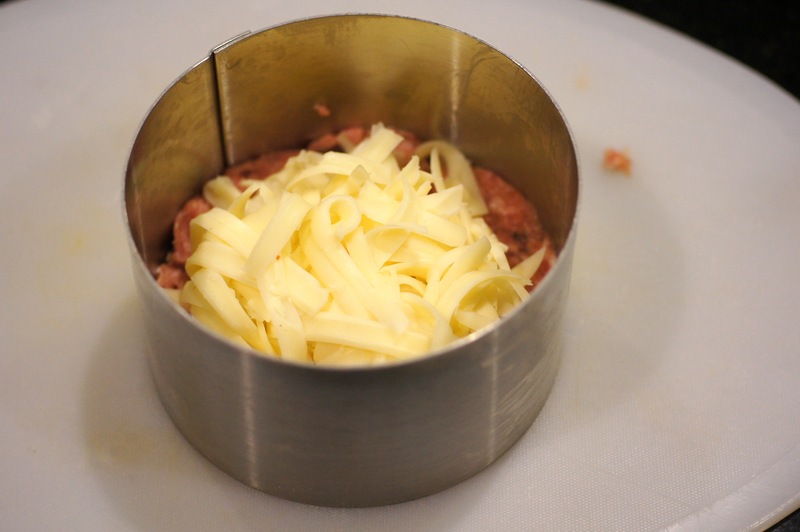 Place the ring mold back over the patty and press down making the patty even once again. 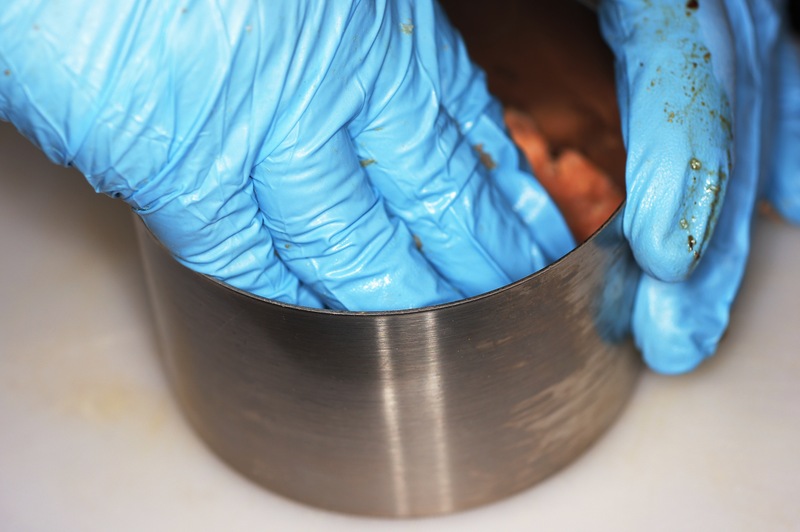 Remove from ring mold and, using your thumb or knuckles, make a small depression in the middle of the patty. 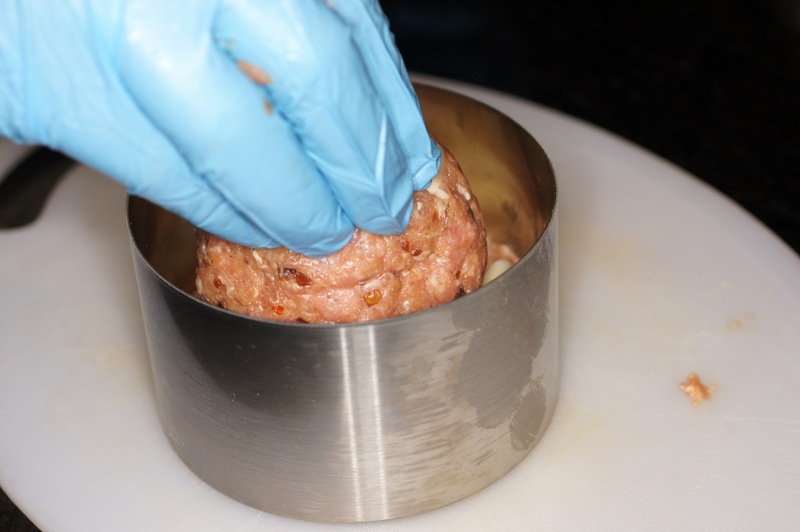 The purpose of the indention is to prevent the middle of the patty from swelling up as it cooks so that it is more of a ball than a burger. Repeat the process with the remaining meat. This makes 4 burgers. 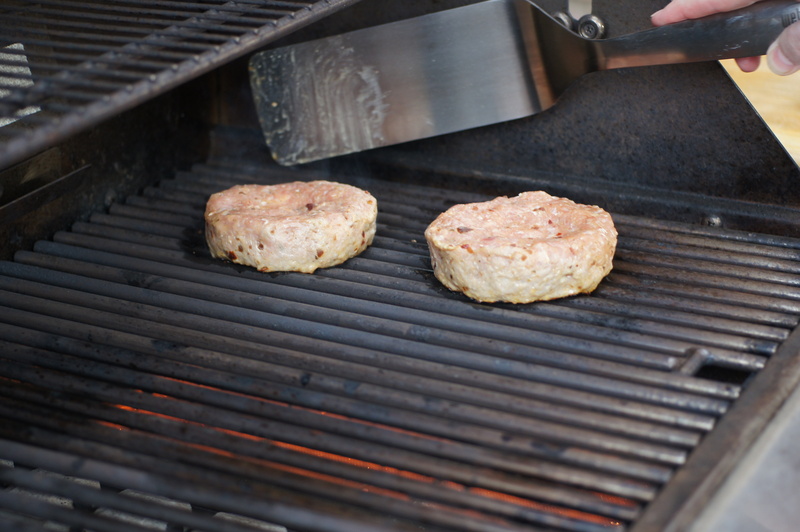 Place the burgers to the grill over medium high heat. 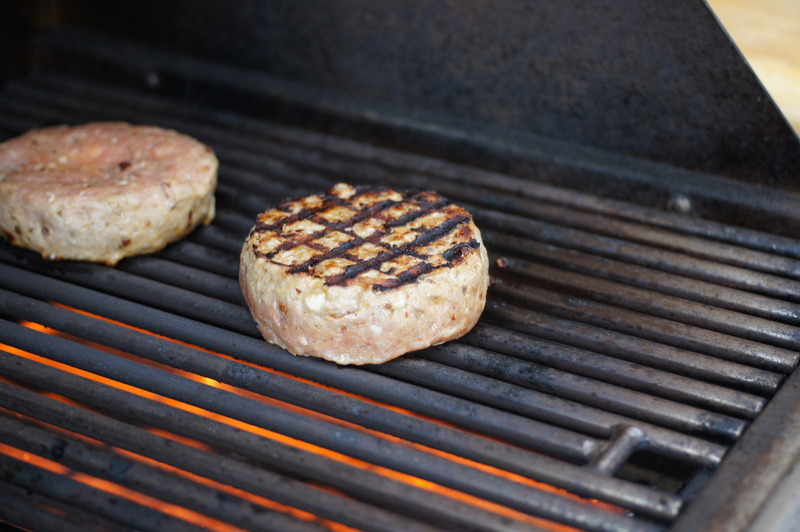 Cook the burgers roughly 1.5 to 2 minutes then turn the burgers 90 degrees to form the cross hatch pattern. cook an additional 1.5 to 2 minutes and flip to cook the other side. See the nice cross hatch patterns? Cook 1.5 to 2 minutes and turn 90 degrees as before and finish cooking for another 1.5 to 2 minutes. Remove from grill and dress however you like. Very good Richard. I haven’t had pork burgers for a long time. Since my sausage making disaster in fact. I did have some turkey sausages that the butcher gave me to try. We both agreed that if you are having sausages, turkey is not the meat to use. Your last shot is really appetising. Thanks, Conor. These were really good. I agree with you on using turkey for sausage (chicken, too). 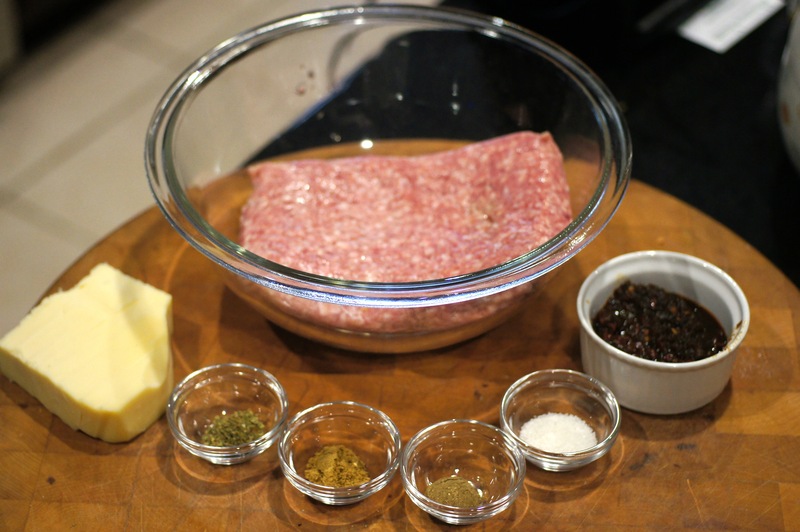 Turkey and poultry simply don’t have enough fat in them and the sausage, even with added fat, is dry. Definitely not my favorite. I had a chuckle when I read that you were experiencing grilling weather. We didn’t even make it to 25˚ today. 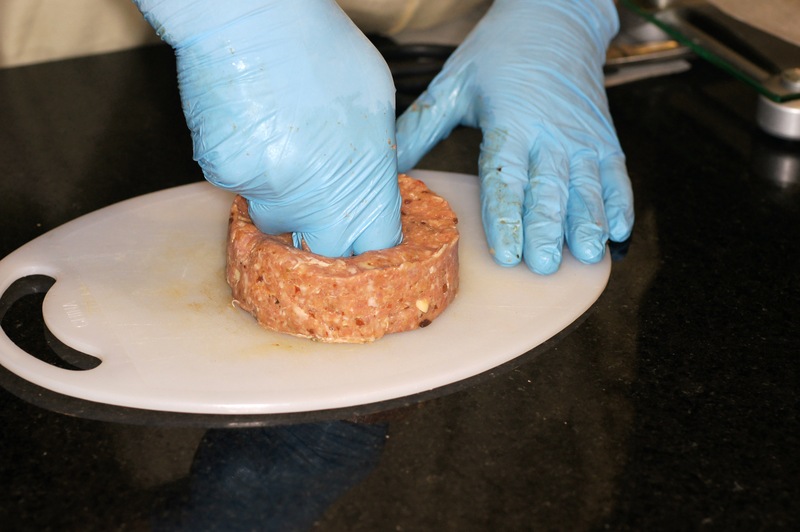 Great idea using a ring to form the burgers and very helpful instructions for sealing the burger’s halves. That final picture, though, is the exclamation point to your post. Nicely done, Richard. Hi, Stefan. You really need to try a pork burger. They have lots of flavor, are very versatile as to seasoning and are a nice change of pace. 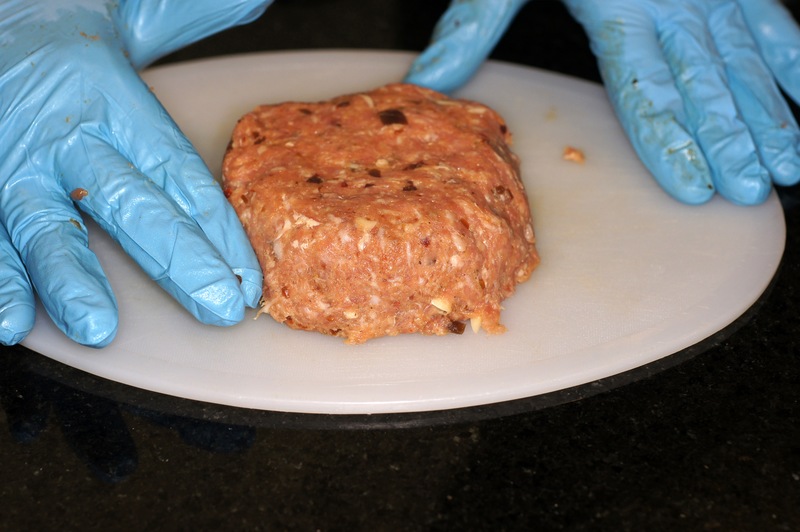 Stuffing the burgers is just fun and your guests will enjoy the surprise. You can stuff them with almost anything which makes it even more fun. I agree with you about Chihuahua cheese reminding me of a little yappy dog/large rat. 🙂 Chihuahua is a Mexican province and chihuahua cheese is a semisoft, mild flavored cheese that is very common in Mexican cooking. I was thrilled when I finally found it at the local market. I’m glad you like them and are enjoying the chiles. I was going to send you a pint of the pickled chipotles but was afraid you wouldn’t like the heat. So, I only sent a half pint and, now, I regret it. Sorry. I found a Dutch website that carries some Mexican products, including dried chipotles (as well as ancho, cascabel, arbol, guajillo, mulato, pasilla and piquin). So I guess I’ll have to make my own batch when these run out 🙂 Thanks for introducing me to this stuff! LOL. Live and learn, I guess. I really love the salt shot! That’s Baby Lady’s favorite shot, too. Coincidental timing, Richard. I just made myself a pork burger for my “brunch” today! But I doubt mine was as good as yours. I just put a slice of pepper jack cheese on top of mine. 🙂 I’ll have to try yours out, if I can find the Chihuahua cheese! Hi, Peggy. Great minds think alike. 😉 I found the chihuahua cheese at the Central Market in Plano. They just started carrying it. Sounds like your spring is going better than ours. We were greeted with 8 inches of snow. Sigh. Really like the addition of the peppers. Must try that when I’m getting creative with burgers this summer. Hi, Virginia. Our Spring is doing much better than yours. Our third son live in Portland, Me. and he was complaining about the 8 inches of snow on the first day of Spring. There is a reason I live in Texas. I would rather be hot than cold. You need to make these pickled chipotles. They really are good and make this burger absolutely sing. The white stuff is a bit much. We got about the same as your son. I’m ready to garden! Don’t know why but my first comment didn’t seem to go through…disregard is it has. 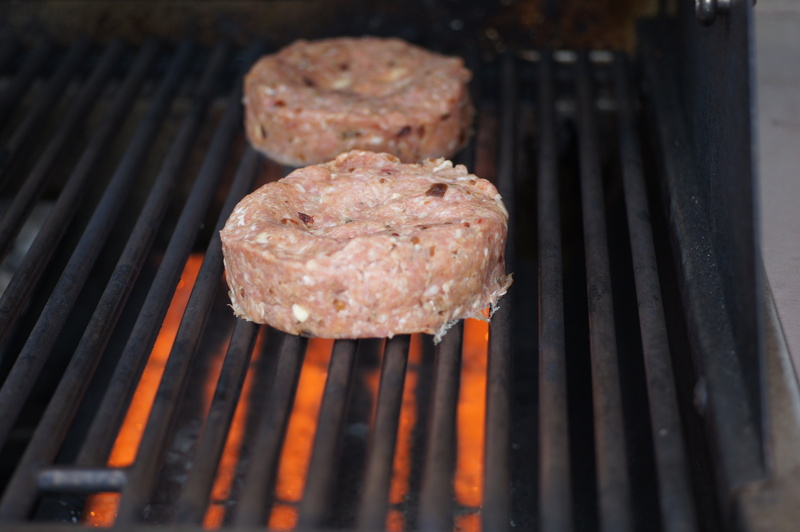 I can only dream of outdoor grilling and made burgers stuffed with blue cheese in the skillet last night. I can’t wait until summer to try your version…it sounds great! Hi, Karen. Thanks for your nice compliment. 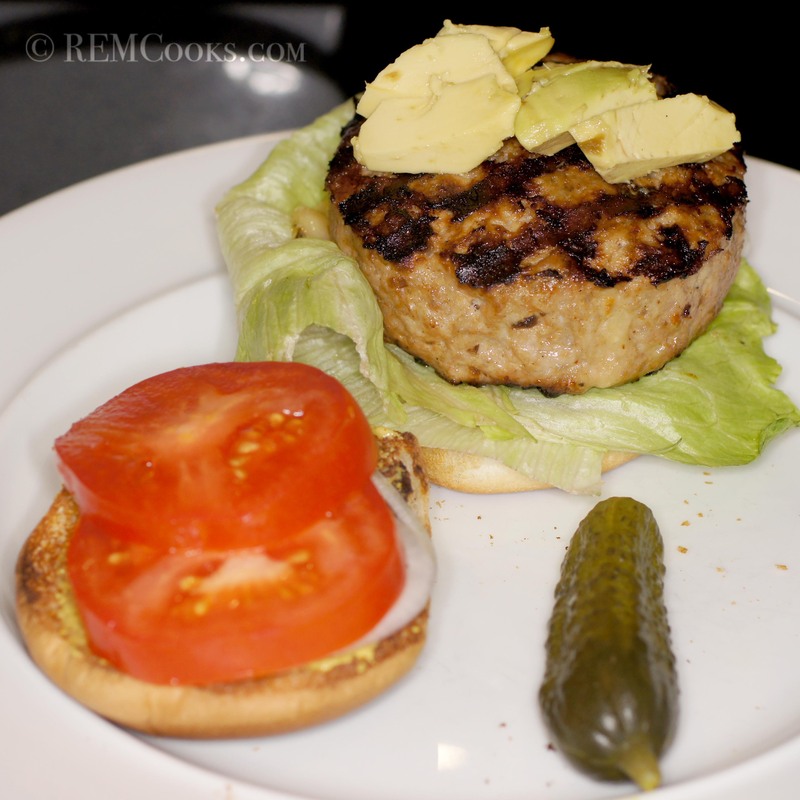 I love blue cheese stuffed burgers and am sure your skillet burger was delicious. Have you ever tried blue cheese and bacon? It’s a pretty good combination. Sorry to hear your post didn’t go through. I wonder if anyone else is having that difficulty. Blue cheese and bacon…now that would make my husband smile. Hopefully it was just a glitch…glad you got this one. Stunning looking burgers, Richard. I’ve never had pork burgers before, but they look to die for. Nice grill marks and chihuahua cheese is one of my favorites. I totally agree with the gloves. I once made two cookie sheets worth of ABTs (stuffed jalapenos) bare handed. Later, parts burned that should never burn. Learned that lesson well.